This article is about the modern sports car manufacturer. For the historical motorcycle and car marque, see Ariel (vehicle). Ariel Motor Company Ltd is a low-volume performance motor vehicle manufacturing company in Crewkerne, in Somerset, England. Founded by Simon Saunders in 1991 as Solocrest Ltd., the name was changed in 1999 to Ariel Motor Company Ltd. The original Ariel Motors remains as the trading company of the Ariel Owners Motorcycle Club (AOMCC) Ariel Motorcycles firm. Ariel Motor Company is one of the UK's smallest automotive companies, with just 19 employees, producing up to 100 cars per year. The company manufactures the Ariel Atom, an extremely light, high performance car, powered by a Honda Civic Type-R engine and gearbox. The Atom is the world's first road-going exoskeletal car; it has no bodywork or roof, and is built entirely around the tube chassis, making it weigh less than 500 kg (1,102 lb). This means that the latest model, the Ariel Atom 3.5R supercharged model has a power-to-weight ratio of around 700 bhp (520 kW) per tonne. In June 2014, the company announced the new Ariel Ace motorcycle. Powered by a Honda 1237cc V4 engine and gearbox, the bike will be produced from 2015 in similar volume levels to the existing car-based products. ↑ "Ariel". Supercar club. Retrieved 17 April 2011. 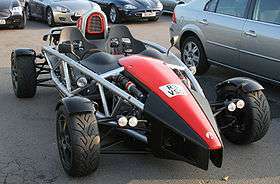 ↑ "Ariel Atom V8 (2010) First Official Pictures". CAR Magazine. 2010-09-08. Retrieved 2010-09-08. ↑ "Ariel Atom". Fifty Magazine. Retrieved 17 April 2011. ↑ SSquires (25 June 2014). "Ariel launch the all new Ace motorcycle". Western Morning News. Retrieved 3 July 2014. ↑ "Ariel Nomad design | Autocar". www.autocar.co.uk. Retrieved 2016-08-20. Wikimedia Commons has media related to Ariel Ltd vehicles.